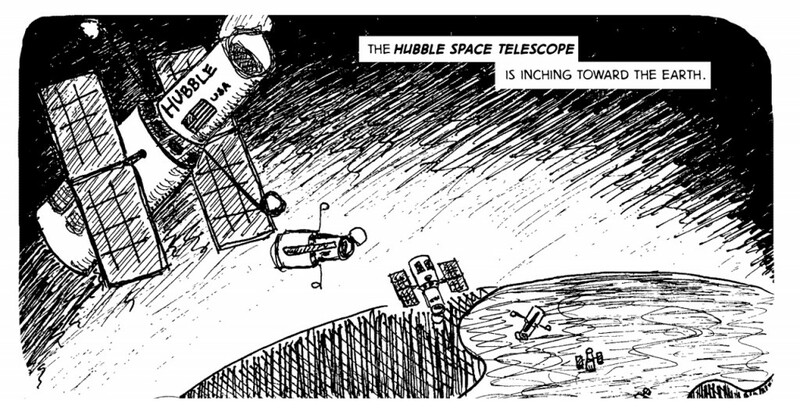 The Hubble Space Telescope is slowly falling back to Earth. Years from now, the telescope’s blazing carcass might streak across the sky at hundreds of miles per hour. By the time the lumps of molten metal plop into the Pacific Ocean, the only instrument still intact will be its 2.4-meter mirror. The renowned piece of glass that once redefined the parameters of the universe, caught glimpses of the earliest galaxies and captured the public’s imagination will sink to the bottom of the ocean. One of the last adjustments made on the Hubble telescope in space was to add a docking point, which will decide its final journey. An unmanned spacecraft will dock with Hubble and either drag it into a controlled fall back to Earth or push it further away. 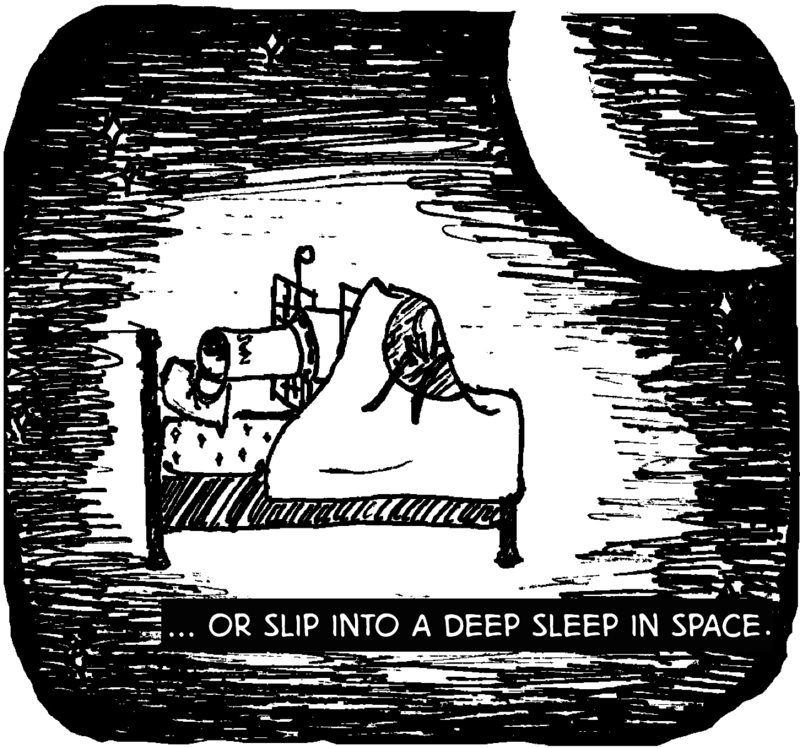 So perhaps the telescope is doomed instead to slip into a quiet sleep, nothing but a piece of junk in the cold vacuum of space. 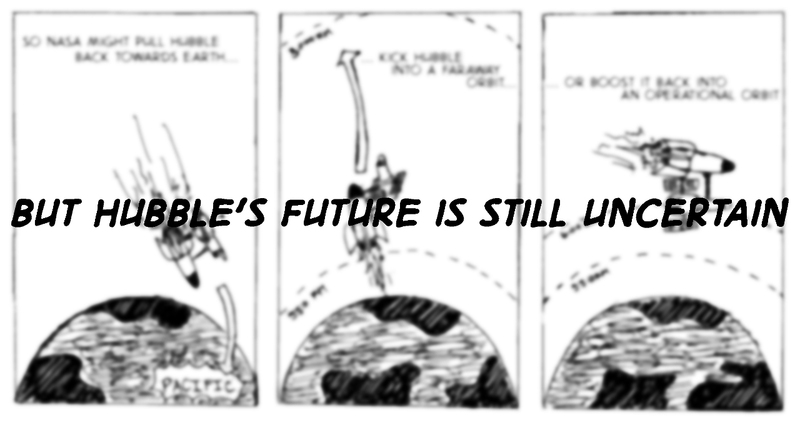 Hubble’s future is yet undefined. Before the space telescope even launched in 1990, NASA knew its scientific importance would be huge. Today, it has glimpsed the universe in its infancy, spotting a galaxy whose light was emitted only 300 million years after the Big Bang. It has played a key role in the discovery of dark energy, a mysterious force that causes the expansion of the universe to accelerate. And it has imaged young extra-solar planets orbiting nearby stars. So NASA had grand plans to salvage the telescope and bring it back down in some safe fashion once it reached the end of its operational life. “The original plan actually includes an agreement with the National Air and Space Museum that Hubble would go on display,” said Paul Hertz, the director of the astrophysics division at NASA. In theory, many of NASA’s old space shuttles had the capability to bring it back to Earth as a museum piece. On display at a world-renowned museum, it easily would have been a marvel to all who laid eyes on it, inspiring future generations of scientists. 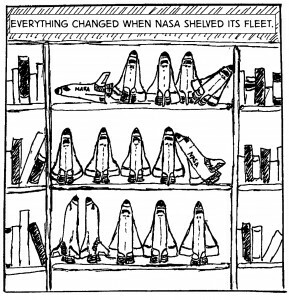 But two things changed: The space shuttle Challenger exploded mid-launch and NASA shelved its shuttle fleet. On January 28, 1986 — roughly two years before Hubble’s launch — the space shuttle Challenger broke apart 73 seconds into flight, killing all seven crewmembers on board. The downward corkscrewing shuttle signaled the first time NASA had lost astronauts during a spaceflight and it brought the space administration to an alarming halt. The astronauts at the time quickly became frustrated that NASA was dragging its feet, said Bradley Peterson, an astronomer at Ohio State University. Although astronauts were eager to fly again, the disaster forced them to rethink what would be worth risking their lives. At the end of the day, low-value missions to retrieve a euthanized spacecraft were not high on their list. 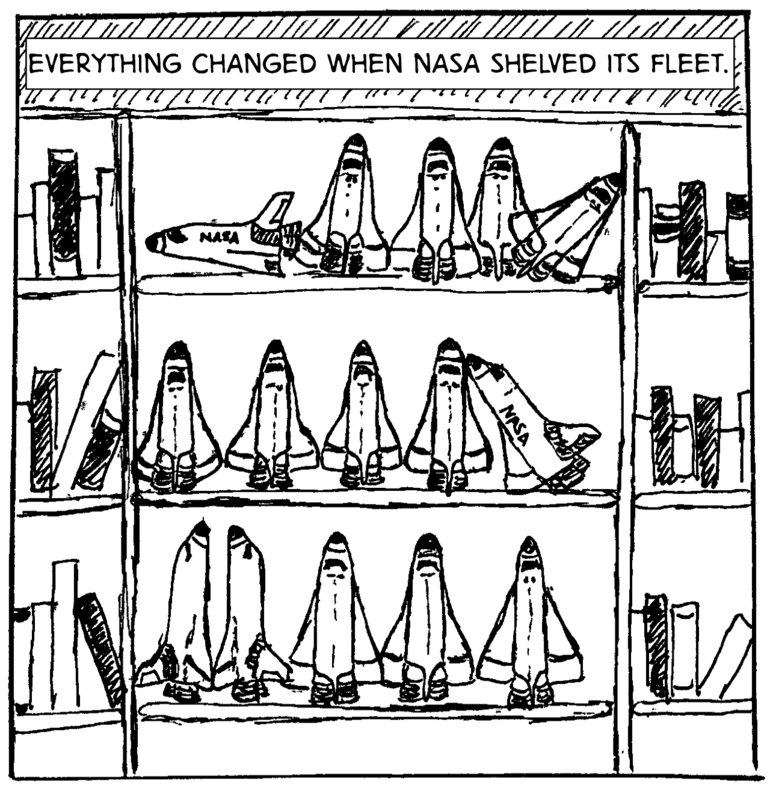 Then, in 2011, NASA retired its shuttle fleet. Not only did this end its servicing missions to Hubble, it also bade farewell to any potential change-of-heart NASA might have had to go pick up its old friend. The telescope was officially on its own. NASA’s designed the first shuttles with Hubble’s size and weight in mind so that the telescope could fit cozily inside the shuttle bay. All spacecrafts running today, including SpaceX’s Dragon and NASA’s new Orion, are an order of magnitude smaller than the old shuttle fleet. 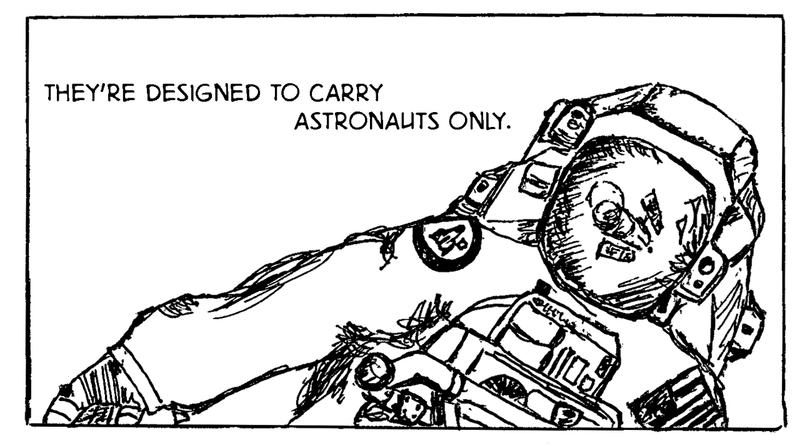 They’re designed to carry astronauts only and therefore cannot retrieve the lonely telescope. Nonetheless, Hubble’s life will end eventually. 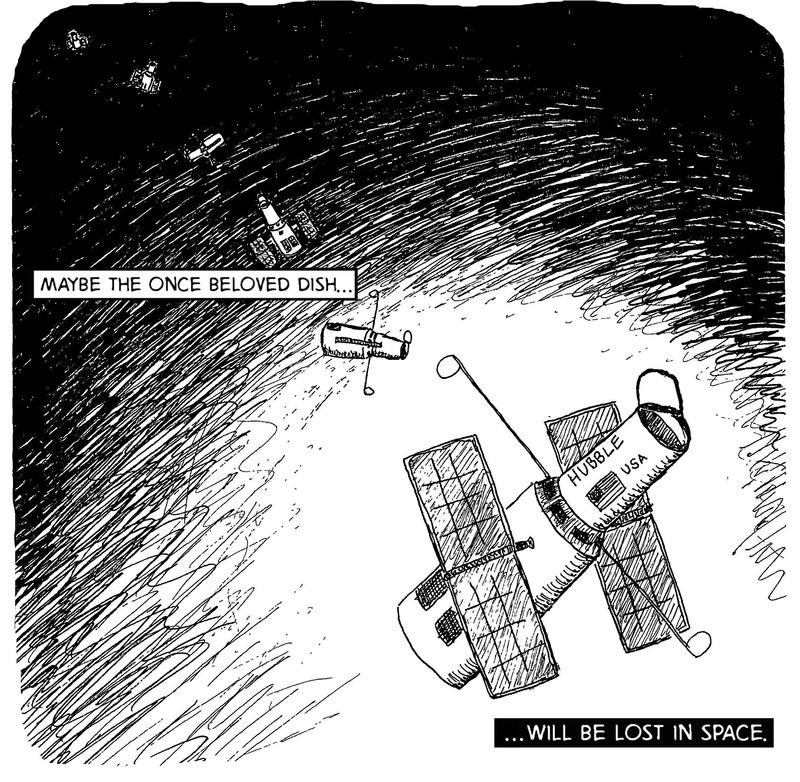 Every second, the 24,500-pound satellite slips further out of orbit and inches closer to Earth. Although most people think the Hubble Space Telescope is in space, it actually lies in the thermosphere: the largest and most tenuous part of the Earth’s atmosphere, which affects the orbits of satellites that fly within it. The thin atmosphere creates a small but significant resistance, which slows satellites down and decays their orbits. 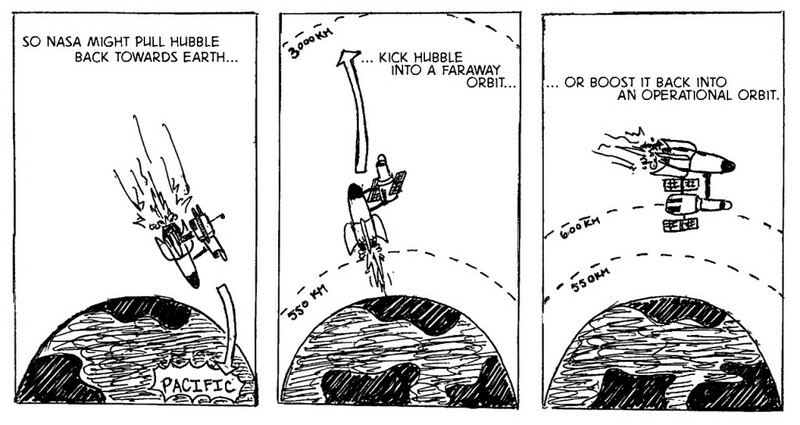 If not corrected for with their own motors or periodically pushed back up by a rocket, they’re doomed to fall back to Earth eventually. Both the space station and the Hubble telescope receive — or in Hubble’s case, received — periodic boosts, lifting them to higher orbit. If either one were to fall to Earth, the damage could be grave. 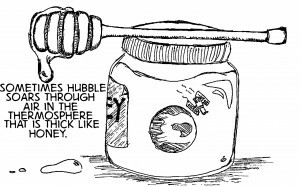 In Hubble’s case, most of the instruments would burn up in re-entry, but scientists speculate that the main mirror assembly, a 1,825-pound object, would make it to the ground intact. A few years ago, then-chief scientist of NASA’s Cosmic Origins Program, Dominic Benford conducted a study that explored how the agency might prevent an uncontrolled re-entry. Benford and his colleagues considered a total of 15 different scenarios, but they all fell into three broad categories. The first option is to do a controlled de-orbit, in which an autonomous spacecraft docks with Hubble and pulls it back toward Earth, forcing it to splash into the Pacific Ocean. 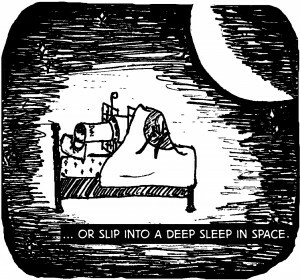 The second option is to dock and boost it into a higher orbit. Hubble currently orbits 550 kilometers above the Earth, so in an orbit as high as 2,000 kilometers, it would take a very long time for the spacecraft’s orbit to decay. Both of those options assume that Hubble has reached the end of its technological lifespan. But the third option remains open if its orbit starts to decay well before its instruments start to decay. (Gradually the batteries, solar panels and telescope-pointing instruments will fail.) If the instruments hold on, this option would boost Hubble back up to a reasonable orbit again, something like 600 kilometers, where it could operate for even longer. Benford, Hertz and their colleagues predict that Hubble won’t re-enter the atmosphere until sometime around 2037, however, well after its operational lifetime. 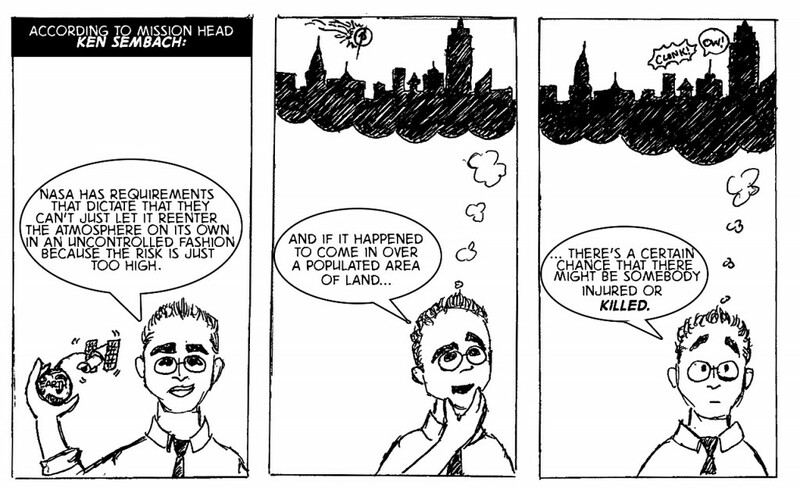 Peterson, on the other hand, predicts that it could occur as early as 2019 and as late as 2030. The difference in estimates is due largely to the uncertainty of the solar cycle. Every 11 years, the sun becomes more active, causing the Earth’s atmosphere to heat and swell, extending farther into space than it otherwise would. This pushes away lower density layers and brings up higher density layers, causing Hubble to fly through a denser atmosphere than normal. With more air to fly through, Hubble slows down further — its orbit decays more rapidly and its lifespan shrinks. “It will reach some point where it will begin to tumble,” Peterson said. 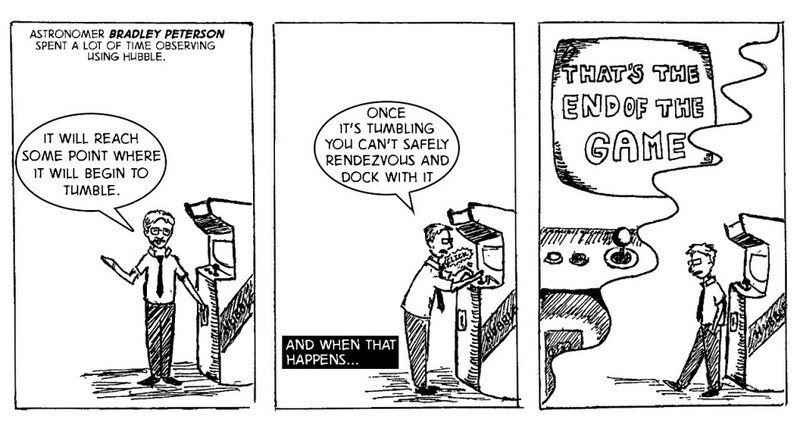 “Once it’s tumbling, you can’t safely rendezvous and dock with it.” That’s the end of the game. Either way, its demise seems grim. But Hubble has always been the “little telescope that could.” Initially deemed a failure, it turned out to be one of NASA’s most successful missions. 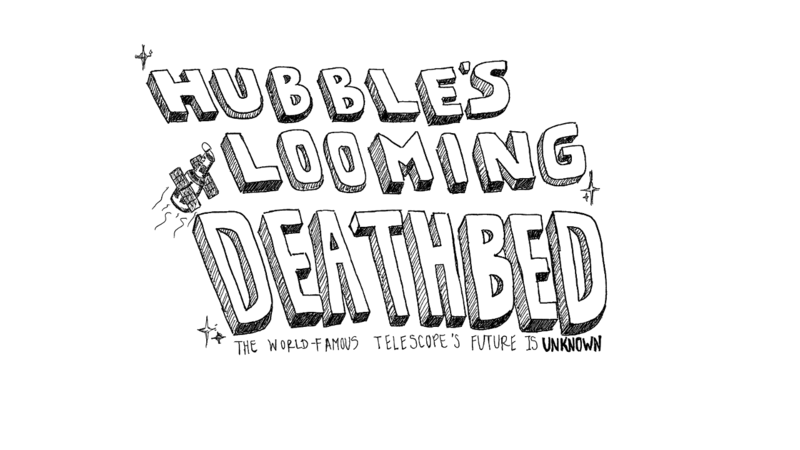 So perhaps Hubble’s lifetime will come to a very fitting end. The telescope that brought the universe within our reach might one day slowly inch toward the distant planets, stars and galaxies it first photographed — a dormant dish finally floating amongst the vast universe.